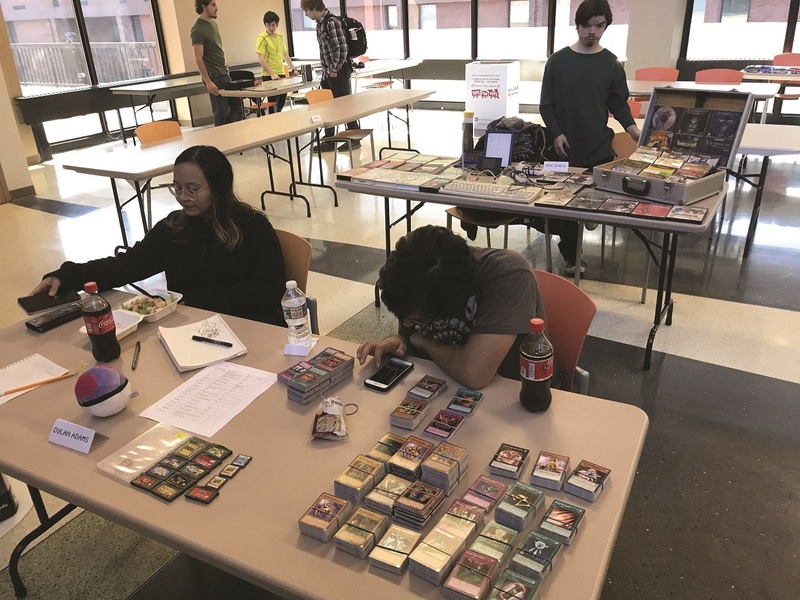 On Nov. 8, within the Solarium in the Rollins Center, Game Club took over from 1p.m. to 7p.m. to host a flea market. Students of the club were able to bring in their own items to trade or sell, mainly video game items. President of the gaming club, Ricardo Ramirez, is a 24-year-old Multimedia major who lives in Sellersville. He was the leader of this even. “The club earns money if you decide to have us sell the stuff for you,” Ramirez said. The first available option was to bring your items in early and give them to the club members, they would raise the original price and keep the difference between them. For example, if you have something for $90 originally and they raised it to $120, the club would keep the extra $30 and you can keep the $90. Alternatively, if you sell by yourself without giving to the club, you have to pay for a $5 registration free, and you lose a 10% difference. “For example, if you sell $10, we keep $1, and you take $9.” Ramirez detailed. “The money we earn through this event will go towards giving the club more games, newer consoles and also being able to repair broken down consoles and supplies.” Ramirez promised. Dylan Adams, a 20-year-old History Major from Yardley is taking part in selling some unwanted games alongside other members of the club. His most expensive item was a DS game called Pokémon Rangers that went for $35. Jack Shoen from Doylestown, a 20-year-old with a major in Multimedia, is another one of these students. His most expensive item was a bundle: Lost Planet 2 and 3, altogether for just $35. “I have my reasons as to what I plan on doing with the money.” Shoen said. Eric Dubow, the 19-year-old Communications Studies major from Bensalem was selling a DS that went for a cheap $30. “I don’t know what I will end up doing with my money, as part of it is going towards the club, so I need to see how much money I make first.” Dubow explained. Abby Nisula, 18-year-old with a major in Bio-technology from South Hampton, provided a different and unique service; selling her own drawings. “I’ve been drawing since preschool. I’m not looking for a career; I just like to draw.” Nisula stated. Full-Color colored pencil drawings were for $20, and Monochrome drawings were for $15. Simplified line art full body pictures were just $8. She plans on using the money she made to buy more art supplies. Despite all of this, the day was still considered slow and unsuccessful by President Ramirez. However, he plans on having another flea market day on Dec. 6, the same day of the Smash Brothers tournament, in the Linksz Pavilion. Be sure to stop by if you have the time and money!